This year one of my goals is to boost our money earning events. I have a lot of girls whose families are unable to contribute financially to fund our more expensive adventures. And there are *so many* adventures I want to take my girls on! When you consider that there are amazing world centers in so many countries that Girl Scouts can stay at, plus the very cool Girl Scout destinations program… the opportunities are limitless. Assuming, of course, you can pay for them! My girls are just getting to be old enough to start seriously looking into the opportunities available via the Girl Scout Destinations program. Pet peeve alert: so many girls leave scouting at the Junior level. When girls reach Cadette level is when the program actually really opens up to them! Anyways, point being that I’m looking for creative ideas to help my troop raise funds, not only for our troop to be more self sufficient in general, but with the long term goal of taking the girls to Savannah, GA. To do all the fun Juliette Gordon Lowe stuff as well as Girl Scout Quest which is like a giant scavenger hunt all through Savannah. So fun! So $$$! I had tried doing a Daisy Journey in a day last spring, but only a few people signed up, so I canceled it. This year I decided to try something totally different; there are already lots of troops offering journeys and badge programs, but what about something just for fun? What about something where girls can get messy and experiment and then leave, and their leaders/parents don’t need to worry about cleanup? What about… SLIMEFEST. 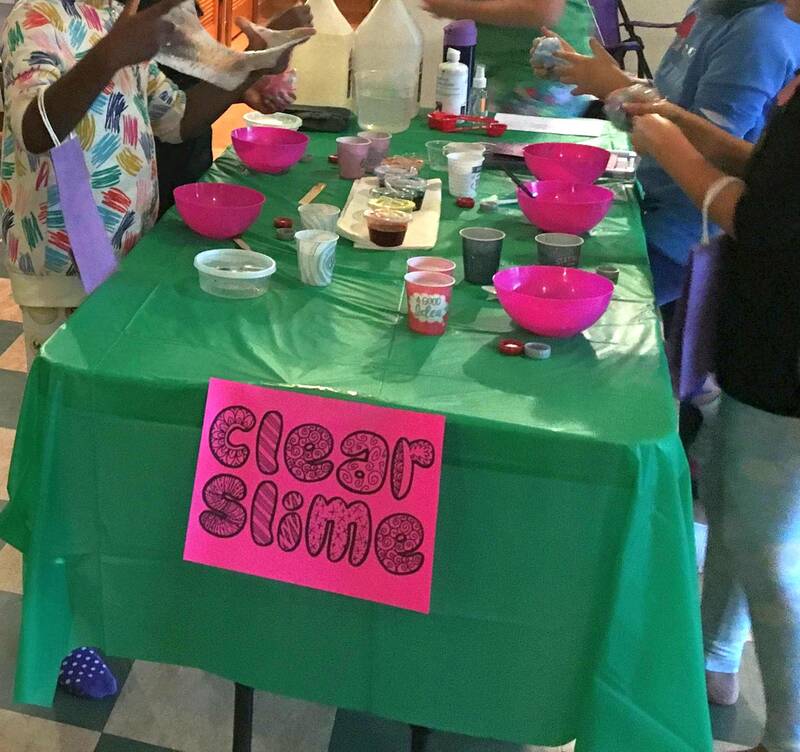 A few things that contributed to success were having a table for each type of slime, and then giving girls a time limit per table and having them rotate. That way there were not more than 4/5 girls at a table making one type of slime at a time. 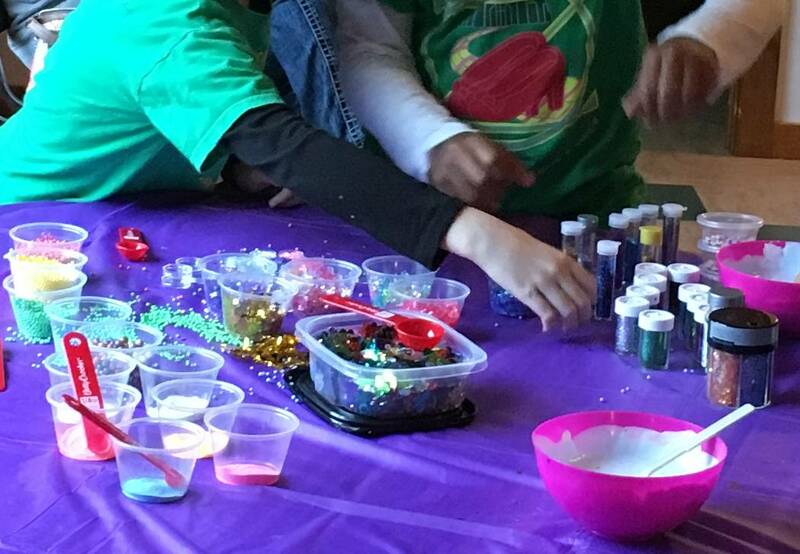 We also had a “bling your slime” bar with all kinds of glitter, sparkles, sequins, tiny flowers, beads, etc, that girls could go add to their slime. 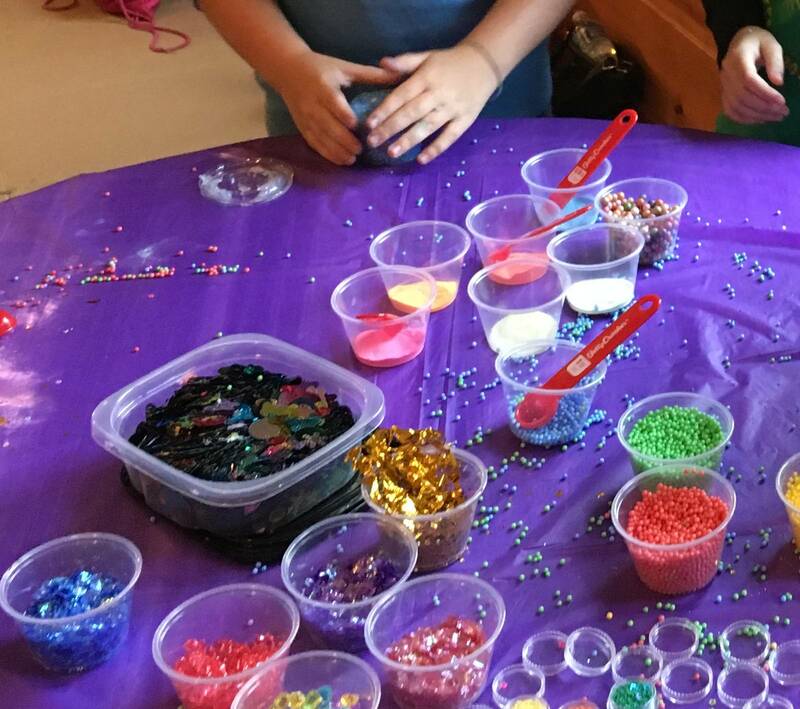 We had two girls whose job it was to woman the bling table for the event. The only real fail of the event was the edible slime, and it wasn’t a total failure. I looked up recipes for edible slime, most of them involve combining corn starch with some edible something… melted starburst, pudding mix, jello mix, and marshmallow fluff were the ones I checked out. I didn’t want to be melting starburst around kids, so that was out. We tried the jello version at home, and that worked ok. Marshmallow fluff version was a sticky disaster! So we wound up going with the jello slime recipe. Somehow though this recipe seems to react differently to different body chemistry. One girl had her jello slime all formed when it suddenly just fell apart; one of the weirdest things I’ve ever seen! Other girls were never able to get it to a decent consistency. Also the bright colors of jello DO dye their hands kind of outrageously. So there are some caveats with jello slime! To be honest the pudding slime seemed a little easier to work with and if you use the vanilla kind you could probably just add a few drops of food coloring. I think we may try that for next time. This was my first time running an event that other people PAID to attend. I hadn’t anticipated how much pressure I’d feel and how worried I’d be that the attendees wouldn’t like it! But everyone actually had a great time. We even had s’mores at the end, in true Girl Scout fashion!